Chicken breasts are a low-fat, high-protein food that can easily be used in nearly every type of cuisine. 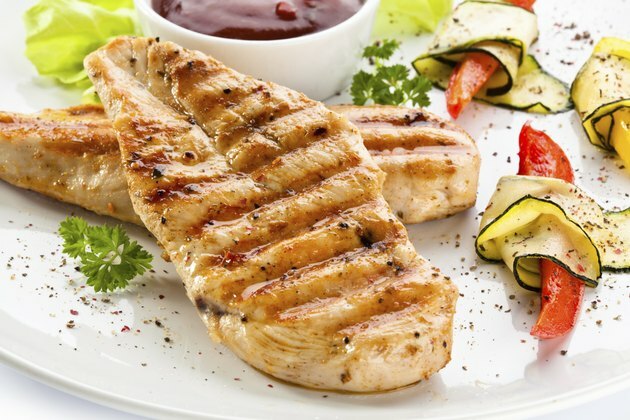 Boneless and skinless chicken breasts are low in calories and are frequently eaten on a low carbohydrate diet. They are one of the most versatile proteins, taking on the flavor of virtually any seasoning, spices or marinades imaginable. Use boneless skinless chicken breast as a low calorie way to add substance and texture to soups, stews, savory pastries and main entrees. Do you want to lose weight or be healthier? Join MyPlate Calorie Counter and get access to free meal plans, healthy recipes and at-home workouts. You'll also get daily calorie and macro goals for your fitness journey. Don't miss your chance for amazing results. Sign up today! A boneless, skinless chicken breast, weighing approximately 236 g, contains 270 calories. This makes up 13.5 percent of your total calories, based on a 2,000-calorie diet. Boneless, skinless chicken breasts are made up of 178 g water. Based on this, chicken breasts are over 75 percent water. Water is a calorie-free food, which helps to keep the total calorie content of chicken breasts low. Boneless, skinless chicken breasts provide 6 g total fat per serving. Saturated fat is found naturally in animal products such as beef, poultry and dairy products. A majority of the fat and saturated fat contained in chicken is found in the skin. With the skin removed, a boneless chicken breast contains only 1.3 g saturated fats. The American Heart Association recommends limiting saturated fat intake to less than 10 percent of your total daily calorie intake. On a 2,000-calorie diet, limit your saturated fat intake to 20 g.
Boneless and skinless chicken breasts contain no carbohydrates. Sugar is a type of carbohydrate. Chicken breasts are a sugar-free food as well. Consuming boneless, skinless chicken breasts will not raise blood glucose levels. The remaining calories in boneless, skinless chicken breasts come from protein. Each chicken breast contains approximately 50 g of protein. Per gram, protein provides 4 calories. Based on this, of the 270 calories contained in a single chicken breast, 200 come from protein. Chicken, along with other meats, beans and soy products, are considered high protein sources. How Many Calories Are in Corned Beef?